If you are willing to go into Manhattan, Hi-Collar at 214 E. 10th Street has several versions of Omurice for lunch only (11 to 4). Thanks for the reports. Looking forward to trying it. Regarding price...if I can pay Manhattan prices and get Manhattan-quality food with an hour+ less driving, no traffic, no expensive garage, and an hour+ less babysitter, I'm totally ok with that. We shall see! I'm looking forward to your report Tubbs. If you don't mind paying Manhattan prices, then I think you will love this restaurant. 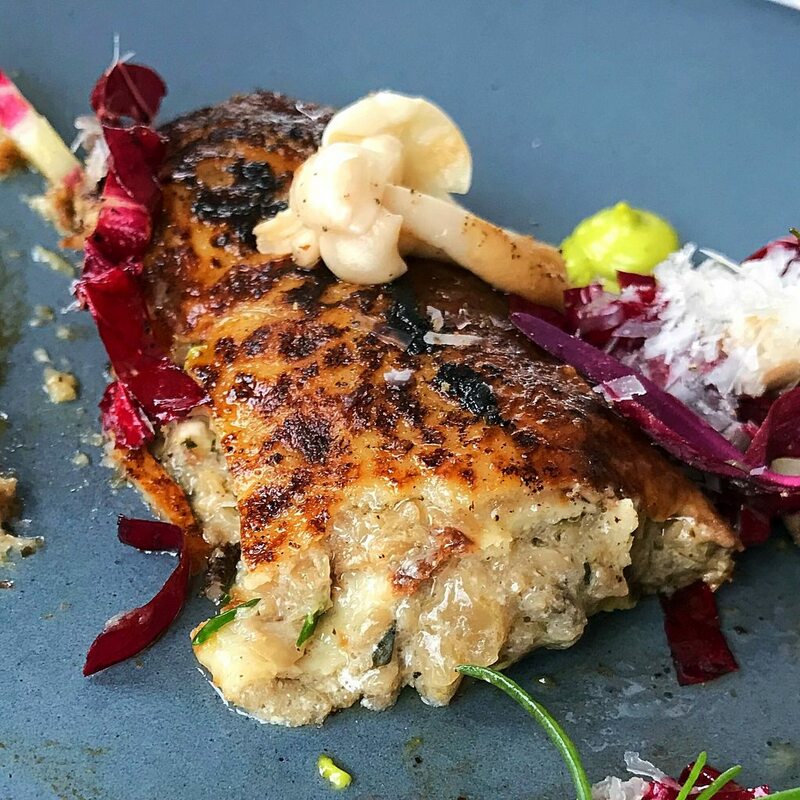 The food was outstanding, and just a little different than what is offered at Viaggio. We eat out a couple of times a week, so I have to stretch my dining out budget into a couple of meals, and don't want to blow it all on one meal. Thanks for the recommendations E.L.A. 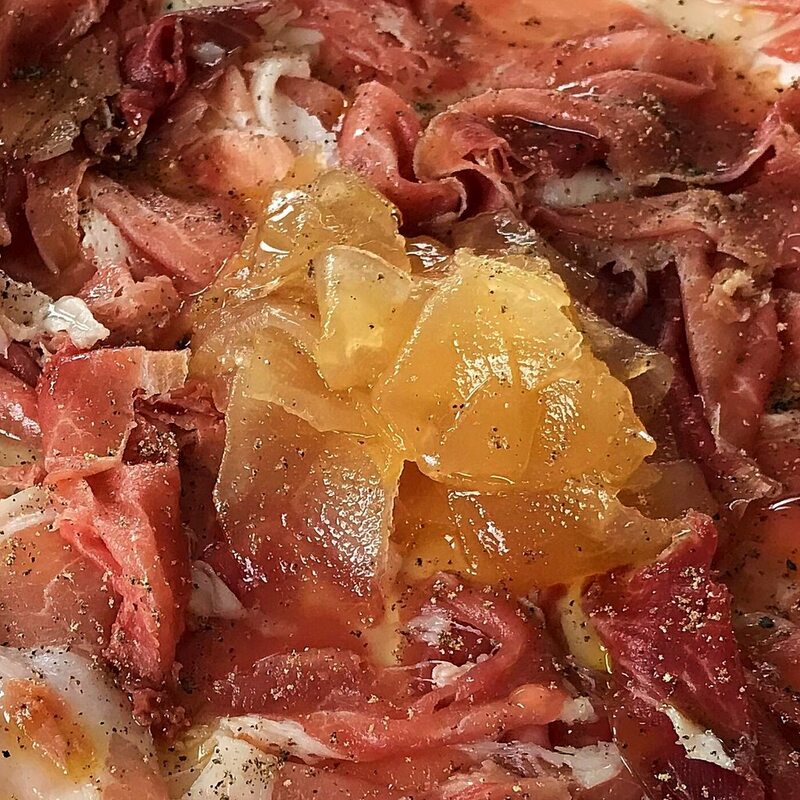 We definitely have to give Mezza in Westwood a try. We tried the one in Livingston and weren’t as impressed. The food wasn’t bad but the indifferent service turned us off. By the way Chef Robbie is having trouble getting help. He is still looking for some cooks and servers. Friday night they were slammed and only had 3 servers. They literally had a line out the door since they didn’t have enough servers to take care of them all. We had an outstanding, but way overpriced dinner at Osteria Crescendo Sunday night. The food and service was impeccable. It was nice to see some friendly Viaggio faces in the house (the lovely hostess Angie and our server Luis). Since Luis already knew us we didn't have to sit through the whole script Everything was very flavorful and beautifully presented. However, we only had 2 appetizers and 2 main courses, plus the $25 corkage fee, and including tax and tip, the bill came out to $200.00. These are Manhattan prices. The biggest overcharge is on the entrees which are supposedly meant for sharing. 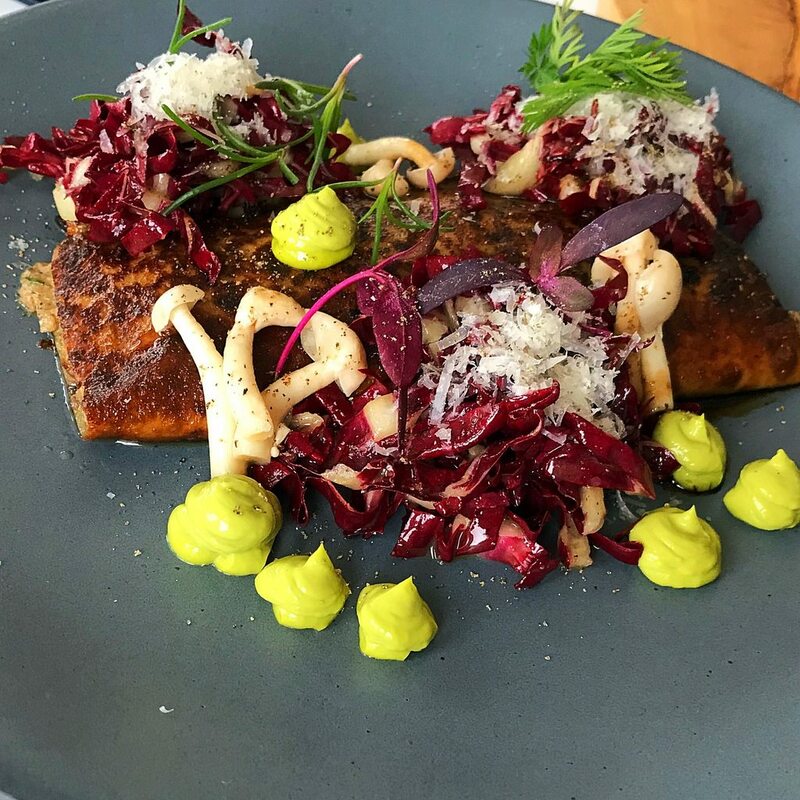 These entrees are only enough for 1 person, unless you are two size zero models I don't think we can afford to eat here on a regular basis, unless Chef Robbie alters his entree prices accordingly. I guess the people living in Westwood are millionaires and can afford the exorbitant markups. I really wish Chef Robbie the best of luck, but the only way I can see getting an affordable meal here is at the bar and ordering little street snacks for $16 a pop (or just ordering an appetizer and pasta dish). We will probably stick with Viaggio. 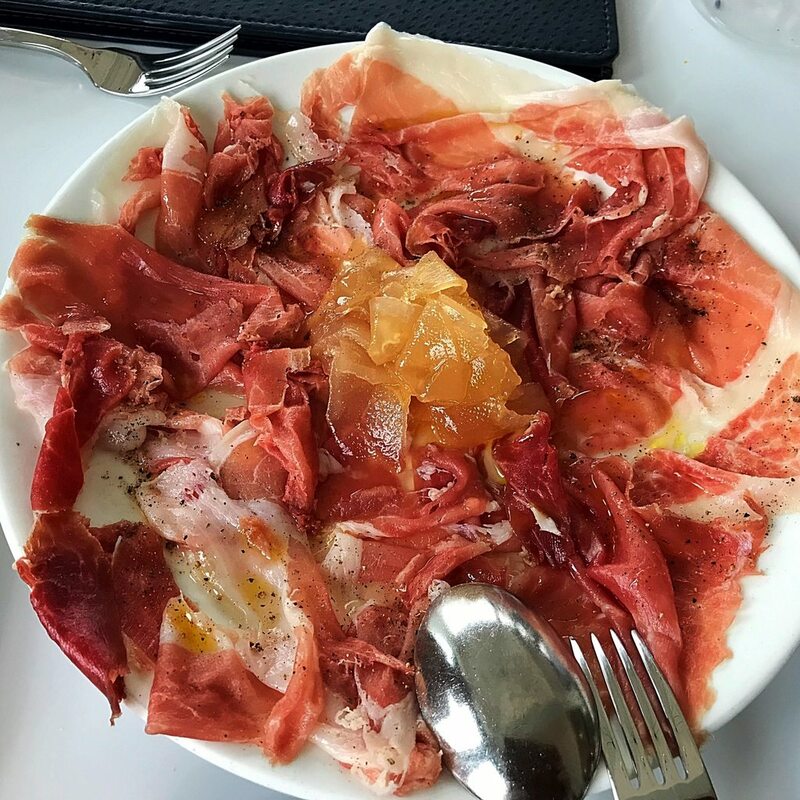 We started off with an awesome house cured 14 month prosciutto pared with an amazing pear mostarda that went perfectly with it. 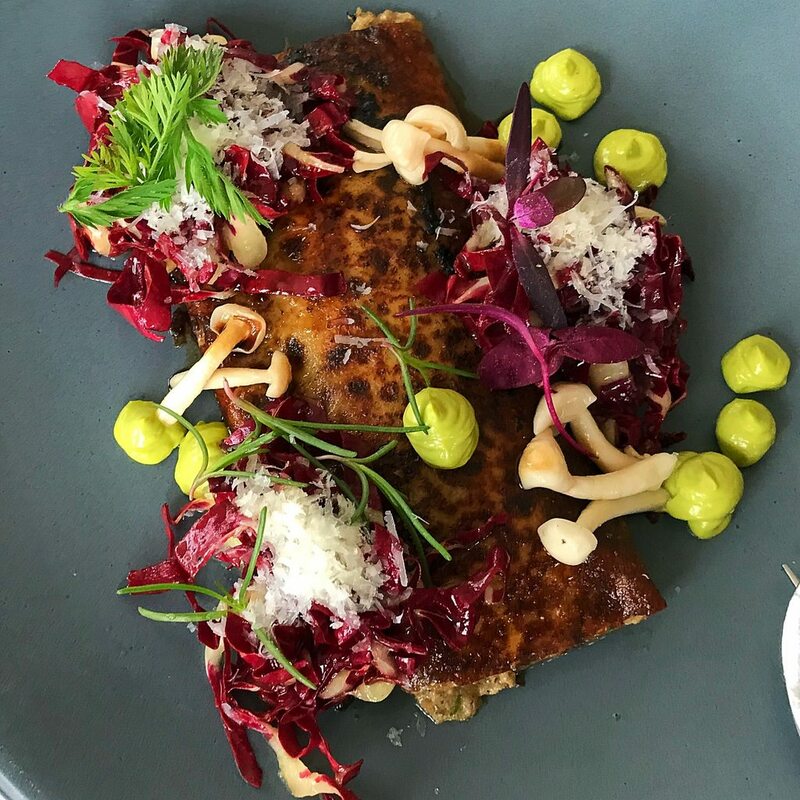 We also had an excellent mushroom crepe with radicchio, ricotta, and acedo balsamico. Both appetizers were very flavorful. 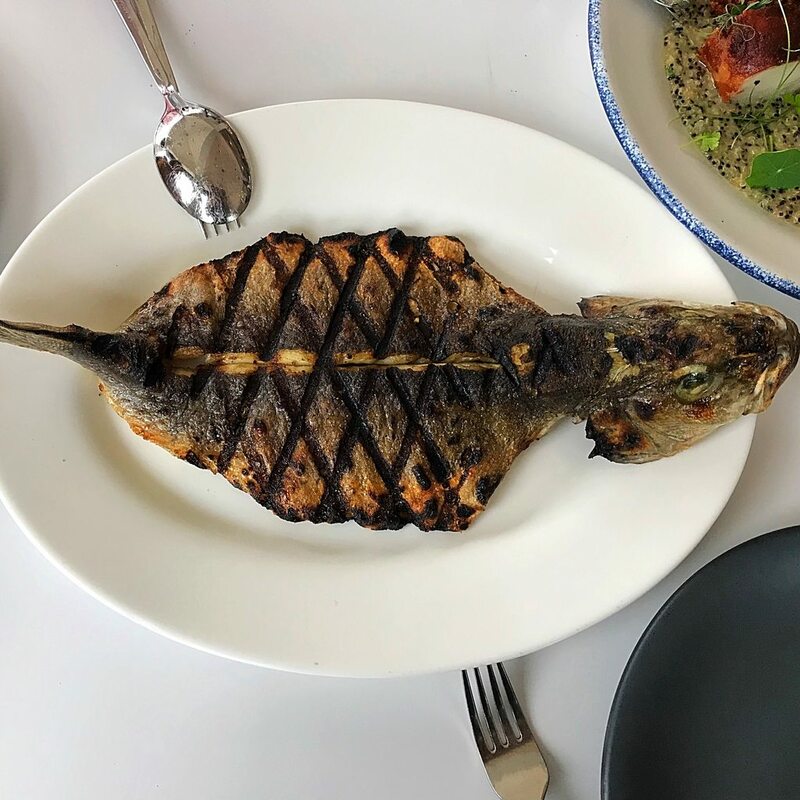 For entrees, we had a beautifully presented whole grilled and deboned branzino with asparagus, fiddlehead fern, English pea, morel, and salsa verde. The skin was beautifully charred but it was not worth an outrageous $59. It was enough for 1 person. The sides were miniscule (1 asparagus cut into 4 pieces, 2 fiddlehead fern, a few peas). There was definitely not enough sides to share for 2 people. 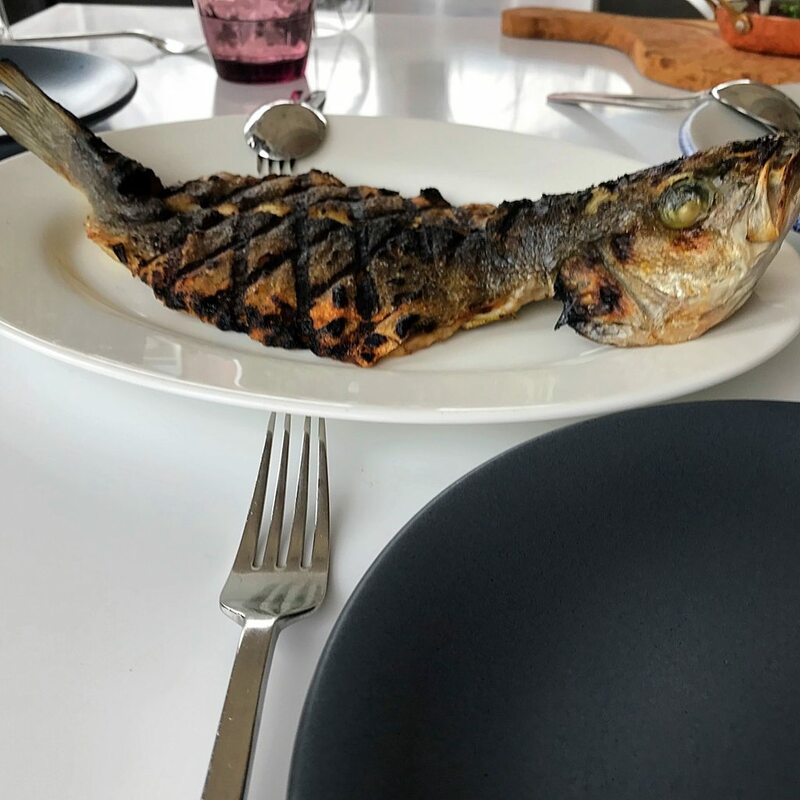 Branzino is a very skinny fish and not very filling. I can see if they prepared a much larger meatier fish that was enough for 2 people, to justify the outrageous $59 price. They would also have to add a lot more of the side dishes for 2 people to share. 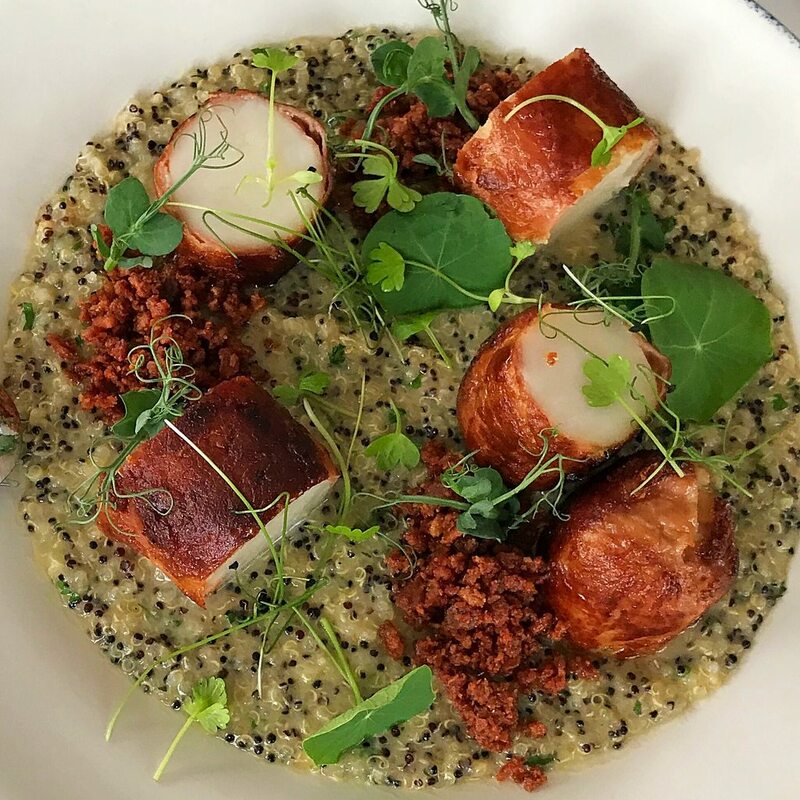 That is why we ordered another ‘sharing’ entree of fabulous scallops wrapped in prosciutto with herbs and quinoa. It came with 5 nice sized and perfectly cooked scallops, which is enough for 1 person, not two. 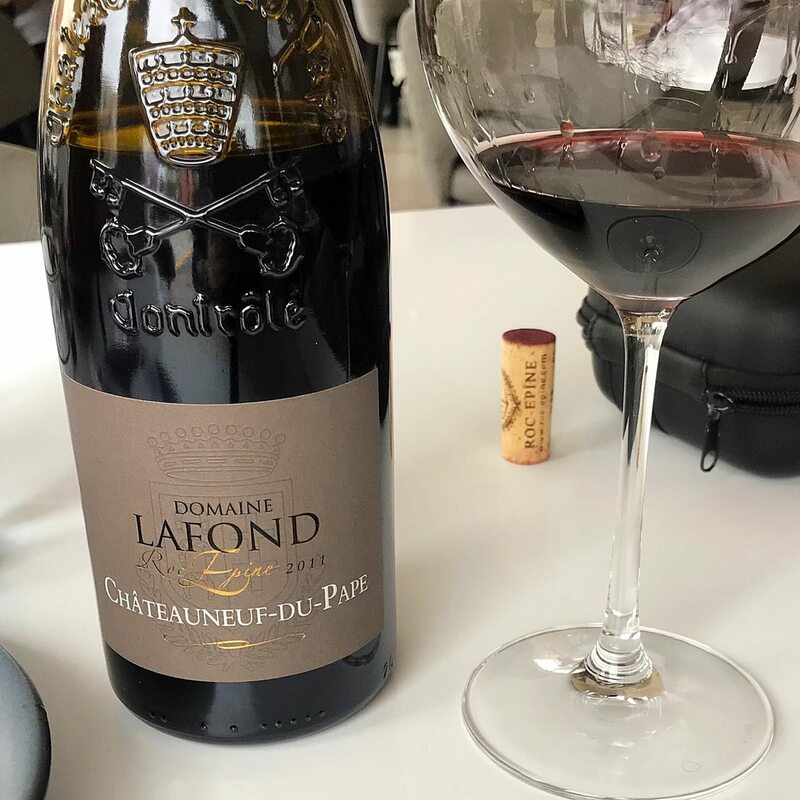 We brought an excellent 2011 Domaine Lafond Châteauneuf Du Pape. Nice write up E.L.A.! Thanks for the parking recommendations. Yes, the waiters in Viaggio are very rehearsed as well. They must teach them from a script The tile floors are going to be a nightmare for Mrs. P. who only wears high heels. She already fell and broke her wrist last year on a concrete floor at another restaurant. I'll have to hold her hand when we walk in.I was eyeing that funghi crespelle or the gnocchi, as well as the 14 month prosciutto to start. Chef Robbie used to make the most pillow soft gnocchi at Viaggio until he took it off of the menu for some reason. 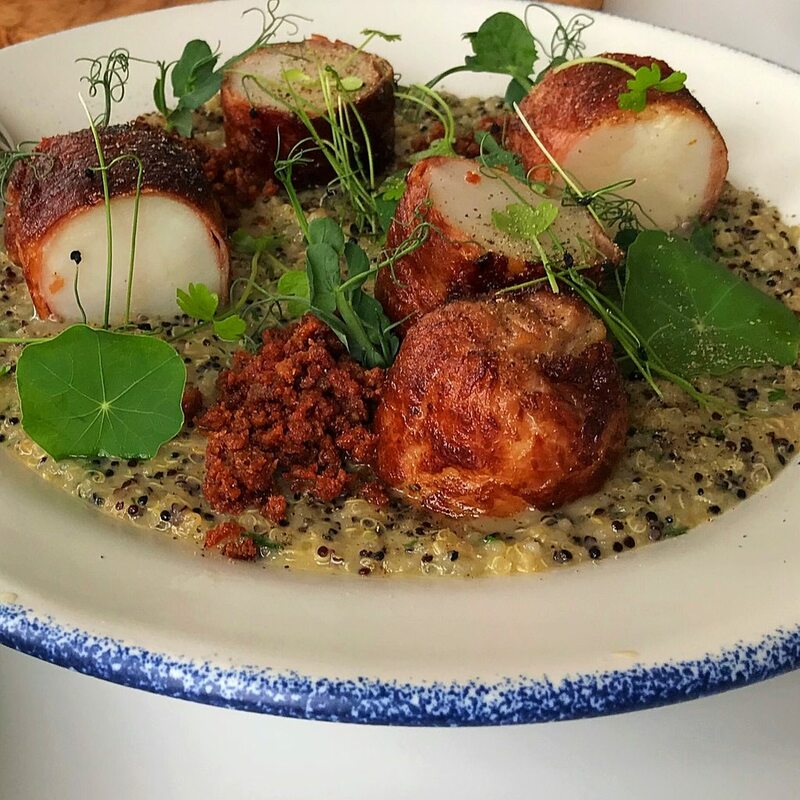 We also might share the whole branzino, but your scallop and prosciutto dish also sounded really good. I'm looking forward to it.